Sambal and Malaysians. In fact sambal and even Indonesians? Remember, we did speak about this our sambal love previously (Sambal Goreng Terasi)? Not once I suppose, maybe repeated a couple of times (Dried Shrimp Sambal & Sambal Udang)? We did and the other we spoke about as well was bread (Asian Egg Mayonnaise Sambal)? Me of course am a number one sambal woman (Malaysian Fish Sambal) and I will proudly progress. How about sambal in bread (Sardine Rolls) and generously lathered atop home made chicken patty? Ohalalala yum! 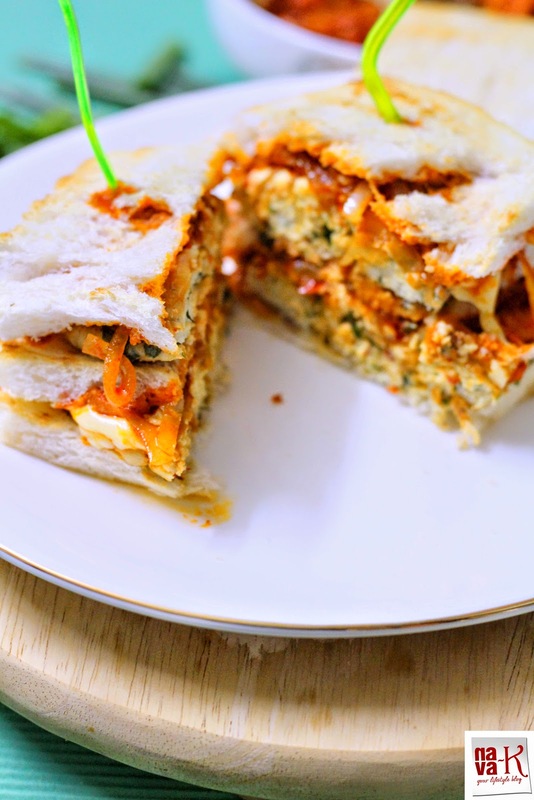 Malaysian Style Sambal Sandwich utterly and sincerely is Malaysian belonging and longing. Of course there have been other variances of sandwiches and even burgers I have shared before and let me quote just one instead flooding overdoing it (Tuna Burgers). Having said that, nothing can close to this Malaysian Style Sambal Sandwich (Malaysian Spicy Sour Fish Soup Noodles, Malaysian Style Fried Mee Hoon, Malaysian Chicken Chop, Malaysian Indian Fish Curry & Malaysian Lamb Stew). Power locking spiciness, soft and tender chicken patty, cheese slices and of course toasted bread. Sounds fabulous and I bet mouthwatering right (Malaysian Eggs Benedicts, Malaysian Chilli Crab, Malaysian Fried Mee & Malaysian Fried Rice)? Heat oil and sauté onion. Season with vinegar, sugar and salt. Split the portion into two. Shape and pat into flat patties. Grill in a portable stove top grill with some oil, to for a crispy outer layer, on both sides, ensure that patties are cooked inside as well. 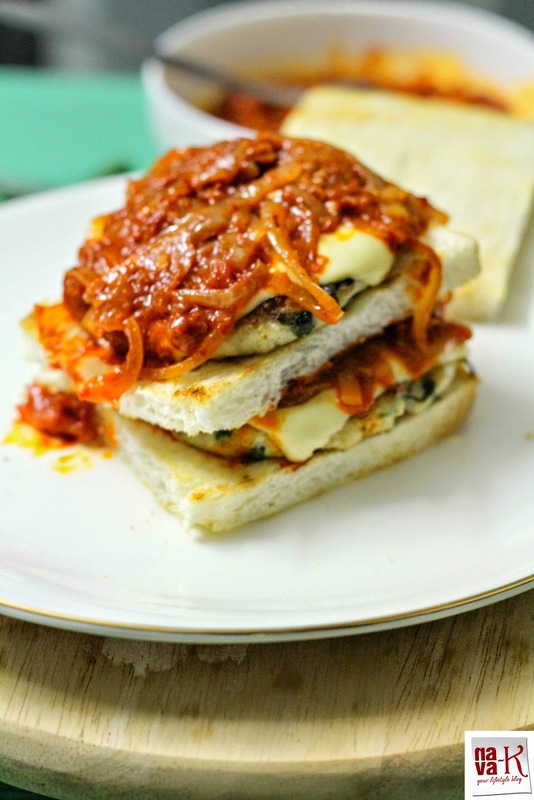 Deck up - toasted bread alongside patties, sambal and cheese. love the layer sandwich, looks so tempting. 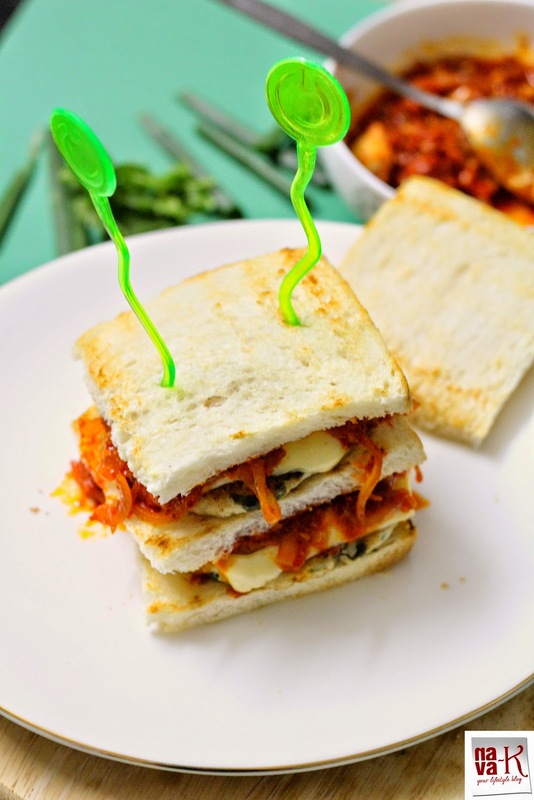 Chicken & sambal sandwich looks so yummy and inviting..
Hey Nava how are you feeling now? When the viewers send their picture,its feels really great for sure .Double decker sandwich looks wonderful .. The sandwich looks delicious! What a great feeling it must be when readers replicate your recipes and tell you about it. All the dishes look very appealing. Innovation......I had Sambal with Nasi Lemak. But, in sandwich......Tempted to try. I want this sandwich, it looks full of flavour, as opposed to some dry one! Food should be such that others are tempted to make it in their homes which is the case with your recipes.They are simple and look extremely appetising. The flavours in this sandwich are unique...wish I could make it tomorrow.